Are you brave enough to try the glass floored Sky Walk? Soak up the stunning beauty of the English Coast at The Emirates Spinnaker Tower - The Icon of The South. Offering incredible views of The Isle of Wight, Portsmouth and the glittering Solent, this is certainly the must-see attraction of the South Coast of England. 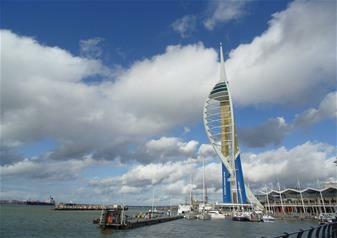 Soaring proudly above the historic Portsmouth Harbour, the tower is a whopping 170 metres tall. Explore all three viewing platforms, including the breathtaking glass-floored Sky Walk standing 100 metres above sea level. Learn about the view with help from the interactive i-VIEW touch screens and audio guides, explaining the highlights of the landscape that spans up to 23 miles. Take in the busy waterways and the stunning visuals that the ever-changing weather creates – whether it’s the glistening of the sun against the water, or the rolling clouds and dramatic waves. Deck two is home to the Cafe in the Clouds and the third deck is open-air, allowing you to experience the elements! A thrilling 110 metres above the ground, feel the wind whipping through your hair as you survey the gorgeous surrounding views. The flexibility of this ticket means you can visit the Spinnaker Tower as many times as you want in one day – at no extra cost!